Ogden Nash's famous poetry collection celebrates the greatest players in baseball history. 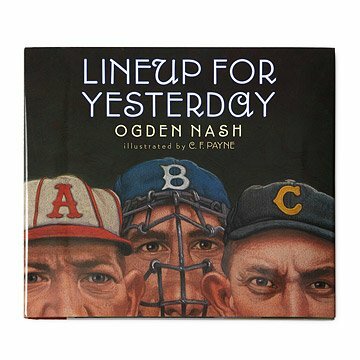 An ode to major league legends, Ogden Nash's famous poetry collection (originally published in 1949 by Sport magazine) celebrates the greatest baseball players of the 19th and early 20th century with newfound energy through illustrations by C. F. Payne. With his signature wordplay and brevity, Nash muses about 24 captivating characters in individual four-line poems. Each poem is accompanied by colorful biographical notes written by Nash's daughter, Linell Nash Smith. A masterful mix of poetry and pictures, each athletic spread brings bygone players to life in this updated classic for a new generation of devoted fans. Printed in Italy. There is nothing negative to say. This collection of short poems is so much fun! This was a gift for a young man and he loved it. He loves baseball! My husband loves the old-time baseball greats. He really enjoyed the art and just reading it. So glad I bought it for him. It was a great gift for someone who is hard to pick gifts for. The price was not over priced. Lovely gift for child or adult! Perfect gift for a baseball fan during enjoys attending vintage baseball tournaments. I would and I would recommend it to anyone! I am planning on inheriting this book! To think of my dad and that is meant so much to him to receive a finely written and illustrated book of yesteryear is a great help in a difficult time! Thank you Uncommongoods.com for having this treasure that I could give to my awesome Dad! For the right person, this is the perfect gift. Humorous and historical.